In our daily work, you may meet this condition: your boss asks you to record data from PDF such as Invoice/bank statement/price list/inventory list. However, we know that PDF is the read-only format document. We cannot edit the PDF file. If you need to manipulate the data, instead of write those message again, you can convert the static PDF file into workable CSV/XLS in a few steps. With using PDF to XLSX Converter (A-PDF To Excel), you can batch extract PDF data and save them to excel quickly. Why PDF to XLSX Converter? PDF to XLSX Converter is simple to use and accurate conversion tool for transform PDF data to CSV and XLS. 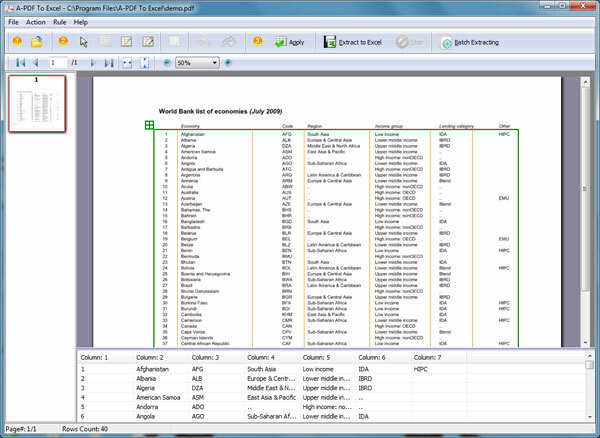 As long as do three steps, you can easily create workable Excel Spreadsheet from common PDF file. 3. Extract to Excel: output to csv, xls format file. The whole process is independent. You cannot need to install other software again, just use PDF to XLSX Converter to finish the conversion work. If you have multiple PDF documents which can be defined with the same split rules, you can batch convert PDF documents into XLS or CSV so that improve your work efficiency. If convert to XLS format, you can convert all PDF files to single Excel file in one sheet/each PDF file to multi-separate Excel files/Each PDF file to single Excel file in separate sheet. If convert to CSV format, you can convert all PDF files to one CSV file/each PDF file to multi-separate sheet. PDF to XLSX Converter provides the command line mode. If you need to automatically finish the conversion work without opening software interface, this feature can help you to do that.